Nowadays, several districts in Indonesia encountered massive natural catastrophes: earthquake, flood, landslide commonly occurred and paralyzed anybody indiscriminately. In fact, every single disaster has brought the big destructive impact: the loss of living-possessions, the damage of infrastructure buildings-houses being a real consequence when nature did not get along with its surrounding. The current phenomena such as Garut`s large flood 2016 and Ponorogo`s landslide 2017 were the authentic proof of the huge anger of nature. In this essay, I just want to focus on highlighting two disasters as mentioned above as the critical reflection with the expectation I can draw input and solution that can be offered In order to prevent such natural tragedy does not repeated in the next future. Large flood happening in the six sub districts of Garut regency (Bayombong, Garut City, Karangpawitan, Tarogong Kidul, Tarogong Kaler, Banyuresmi) September 20, 2016 caused 34 people passed away, 19 people lost, 35 people injured, and 6.351 people fled, 575 houses severely damaged, 239 houses moderately broken, 970 lightly broken. 49 educational facilities, 15 worship facilities, and 2 health facilities also undergoing a breakage (BNPB`s Data). Started by the rain falling heavily and long, Garut`s large flood suddenly occurred by night, never predicted before will come tremendously. The gigantic flood effectively destroyed the dike of Cimanuk`s Garut river with the result, people lived in the coastal area in which they dead asleep dragged by the flow of flood. Some of them were safe, lost, and the rest were died as the victim of flood fierceness. In the history, it was the most serious flood in Garut. Never did happen such mournful disaster before, this miserable calamity has successfully evoked national attention, at least Indonesian President Joko Widodo and his ministers have visited Garut, seeing Garut`s condition after having destroyed by flood tragedy. There was an interesting view when President Joko Widodo observing location area impacted by Garut`s large flood, at that time, through his press release President urged the authority of law enforcer to firmly investigate the trigger of Garut`s large flood catastrophe that lead disruptions and disadvantages either material or non-material. In mathematical calculation, material loss as the consequence of large flood tragedy was estimated reaching 288 billion rupiah (Kompas`s data). In reality, according to analysis from several environmental activist, they concluded that the major factor of large flood happening in Garut because of upstream dysfunction that made to be commercial area, ignoring the ecosystem preservation. As it should be, upstream area constitutes as a protected forest not as business and profit area. The destruction of ecological environment has been ultimate trigger of large flood striking Garut in the past 2016. Based on information, released by forestry ministry 2013, the width of critical land in west java reached 143.417,52 ha. Whereas the width of critical terrain in the area of strategic river flow in West Java reached 137.417,52 ha. Meanwhile, the width of critical land in Cimanuk`s river reached 38.180,80 ha. As matter of fact, the major cause of environmental destruction in the upstream of Cimanuk`s river having width around 16.367,74 ha due to massive activities such as agriculture, plantation, natural tourism, mining, and geothermal. Besides, there was insignificant role from leading sector such as state forestry enterprise (Perhutani) with its platform ‘managing forest together with society’ in revitalizing productive forest area and protected forest impacted by opening and transferring land function has been prime factor contributed to the damage of Cimanuk`s river upstream. It was not surprising if President ordered the authority to make an environment audit and act resolutely towards parties or individuals whom are considered to take responsibility concerning with the damage of upstream sector of Cimanuk`s river. I ever lived in Garut for two years, in my opinion analysis such explained above was absolutely true. Protected forest in Garut today is in danger, upstream area of Cimanuk`s river such in Cikajang sub district that should be buffer zone, earth defender from the swift of rain water debit falling unpredictably within relatively long time is currently being business field. The trees that should be functioning as the lung of the earth, prime breath of forest, has drastically decreased because of deforestation. As a consequence, while rain falls, forest area that should be a water resorption cannot run its function as well as possible. Eventually, when heavy rainfall arrived, water debit overflowed and extremely attacked downstream areas with densely populated. The deadly natural disaster has repeatedly occurred in 2017, landslide hit Ponorogo Saturday, April 1, 2017. This tragedy attacked Banaran village, Pulung sub district, Ponorogo regency. 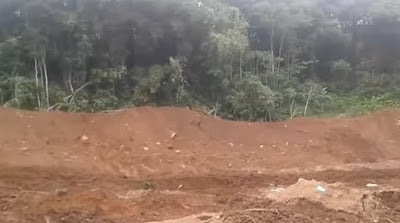 Landslide calamity attacked houses of 36 family heads, generated 28 people lost buried under landslide, 4 people were found, 300 people fled, and the rest cannot be discovered. Due to rescue and searching field were extremely heavy and landslide potentially continuing, then rescue activity has been stopped. Seeing ponorogo`s landslide, we can infer the main factor of it was a mismanagement of forestry sector. As admitted by East Java Governor Soekarwo then upheld by authority of center of volcanology, national geology disaster mitigation, there was little of absorbing land in the landslide area. The trees very minim, slopes area that should be cultivated by trees having strong root in reality have been created as ginger plantation that has weakly rooted. Several victims died while absorbed in harvesting ginger. Catastrophe never inform when it will arrive, nevertheless its sign can be felt by everyone. The friendlier human interact with nature, the friendlier nature respect human around. Conversely, if nature being ignored, not well treated, and tended to be disrupted, the big calamity just only waiting the moment. What happened in Garut and Ponorogo was a brief depiction that nature can anger if humans do not realize their role as natural preserver. Learning from the past precedent, it is time now to reflect, asking to ourselves were we already friendly with the nature and environment around us? According to this question, I eye the importance of balancing pattern and proportionality aspect in treating nature. Behaving proportional, fair, caring with environment has been necessity to certainly assure nature will remain stable and ready to be friendly with us. We may have obsession pursuing profit for every single economic activity we do. But, the most significant one, we should analyze whether what we do has the positive impact or negative one? The frequently happened, human tended to think its satisfaction without thinking the bad impact on the environment and long term living. To overcome it, keeping nature really stable is absolutely must be done. We can diligently plant trees, committed not to chop down and balance risky economic activity (example: agriculture and plantation) with planting vegetation and plants having strong root such as jackfruit, avocado, etc. Furthermore, we can invite the other party who has same concerns to go hand by hand in alleviating catastrophe. The institution such as World Resources Institute (WRI) Indonesia is one of the incredible party who has devoted its dedication in order to make Indonesian ecosystem safe and better. I do support with WRI`s step, doing constructive research, communicating the result to the public, persuading them to behave-employ environment correctly and involving people wanting to participate in saving the world from the degradation are fabulously smart steps keeping Indonesia from the dangerous of ecological destruction. the original title of above article was Garut-Ponorogo`s Disaster, The Real Impact of Environmental Degradation written as the requirement to enroll as young researcher at World Research Institute (WRI) Indonesia. 0 Response to "Learning from Garut-Ponorogo`s Disaster"